Electrical Thermography is becoming a very powerful and effective electrical resource for reducing costs in electrical repairs. 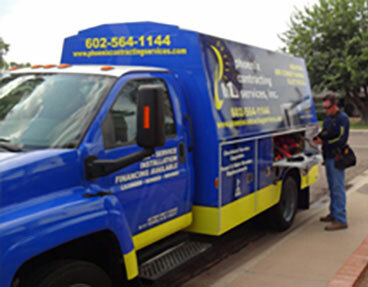 At Phoenix Contracting Services, we always try to keep up with the current electrical trends and electrical tools to assist our customers in preventive maintenance. When electrical equipment fails under normal or abnormal operating conditions, heat is usually associated with the equipment/material prior to its failure. A tool that captures heat and then display its temperature parameters in a picture format is called a thermal camera. These cameras reveal temperature differences(deltas) in material and equipment in real time. An electrical thermographer is the operator of the camera. The thermographer uses the camera and software to produce a report that displays various color pallets defining temperature deltas that aid in the detection of potential equipment failures that might not be visible to the naked eye. Electrical Thermography is becoming a very powerful and effective electrical resource for reducing costs in electrical repairs. Thermography is now listed in the NEC 70 B (Recommended Practice for Electric Preventive Maintenance) as a procedure in aiding the preventive maintenance practice in the electrical work place. Electrical Thermal cameras are quickly becoming a tool of choice for the electrical industry in preventive maintenance programs overseen by facility managers/owners who want to identify potential electrical risks prior to failure. What Are the Benefits of Electrical Thermographic Inspection? The National Fire Protection Association (NFPA) estimates that ten percent of the fires occurring in manufacturing properties are related to electrical system failures, such as failure of electrical insulation, terminals, and related components. Additionally, failures can cause employees to be exposed to live electrical circuits, making them susceptible to serious injury or death from electrocution. By detecting high-resistance connections and repairing them, the likelihood of a breakdown of the electrical wires and related components should be reduced. Other advantages to detecting and repairing these faults are the cost savings from energy conservation and lower outage and repair costs. High resistance in circuits causes an increase in current flow. When current flow is increased, the resulting power consumption will increase. Further, high current draw can cause critical electrical circuit components, such as fuses, circuit breakers, and transformers, to fail prematurely. These failures result in higher maintenance and repair costs, and resultant business interruptions. There are many things that can go wrong, some of which are fatal. Hiring a licensed, experienced electrician will most likely save you in the long run. These professionals are aware of the local and most recent electrical codes and can inspect your electrical panel and wiring for any defects. Electricians go through extensive training to become licensed and are required to complete continuing education hours to renew their licenses, which also keeps them up with national, state and local laws and regulations.